Foliage.org: What are the projected dates for Asheville, North Carolina peak foliage season? Because of the range of elevations in and around Asheville, we are lucky to have an extended color season. You can experience fall color from September through mid-November. Our fall foliage experts tell us that when Western North Carolina has a wet summer, we’ll have an extended fall color season this year. Are there areas, vistas, scenic lookouts or other destinations within Asheville that are known for their uniquely beautiful autumn foliage displays? Any of the scenic overlooks on the Blue Ridge Parkway are an ideal spot for viewing the color and enjoying a picnic. What are the local and regional roads or highways that are favorite scenic routes for North Carolina Fall tourists? For early fall color (September to early October), take US 19/23 from Asheville to nearby Burnsville and Spruce Pine via US 19E. You’ll enjoy great views of Black Mountain and Mt. Mitchell—the highest peak in the eastern US at 6,684 feet! If you’re visiting early to late October, drive along the Blue Ridge Parkway south to US 276 South. This will take you through the Pisgah National Forest and to the trailhead for hiking to Looking Glass Rock. For late fall color (mid October through November) immerse yourself in a maze of orange sugar maples by driving down Kimberly Avenue located just off Charlotte Street in downtown Asheville. Our website offers a calendar of local events by month. Biltmore, the historic estate of George Vanderbilt, is a wonderful fall destination because it has 8,000 acres of pristine forests, hiking trails and formal gardens. The Blue Ridge Parkway Destination & Visitor Center at Milepost 384 is another favorite. Innovative and interactive exhibits and a 22-foot interactive map of the Parkway make this a popular spot for families. The Folk Art Center, located at Milepost 382 on the Blue Ridge Parkway, is another popular destination. It celebrates the handiwork of local artists with hand-made crafts and a gallery. What are some other popular tourist attractions for autumn travelers to Asheville. What are some of the less well known, but much loved local attractions? One popular attraction is Chimney Rock State Park. Its namesake rock formation offers 75-mile panoramic views of Lake Lure and Hickory Nut George. 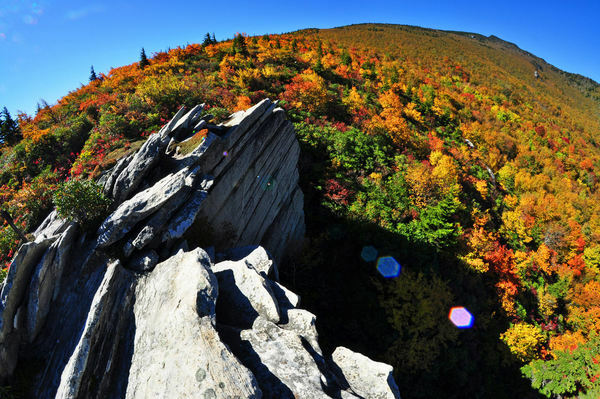 Nearby Grandfather Mountain is another great option because it offers 360-degree views of mountain vistas and is one of the world’s most environmentally diverse nature preserves. Hidden treasures that are less known include the North Carolina Arboretum, a 434 public garden that offers 10 miles of trails, Segway tours and exhibits. Local families also love the Western North Carolina Nature Center—a living museum dedicated to local animals and plants. Downtown Asheville is a great destination for history and architecture buffs. Asheville’s Urban Trail is a self-guided walking tour that highlights the city’s past and art deco architectural elements. Pick up an Urban Trail guide at the Asheville Visitors Center at 36 Montford Avenue in downtown. The Antique Tobacco Barn on Swannanoa River Road near Biltmore Village is a noted landmark for antique collectors with over 70,000 square feet of shopping space and 75 dealers. Whitewater rafting is a fun family activity, because the temperatures are still warm enough to ensure an enjoyable ride down the river. There are numerous rafting companies that operate in and around Asheville, so you can pick an adventure that ranges from mild to wild. Corn mazes and pumpkin patches pop up at several local farms in the autumn. Apple picking and hayrides at the Orchid at Altapass, located off the Blue Ridge Parkway at Milepost 328.3, is also a family-favorite. The official site for Asheville’s Convention and Visitors Bureau, www.ExploreAsheville.com, is the ultimate resource for planning your fall vacation. The web site contains lodging and dining information and details on seasonal getaway packages. Is there anything else you would like to tell visitors thinking about traveling Asheville for fall foliage season? Get up-to-the-minute information on the hottest fall color spots by following @FallColorHunter on Twitter and visiting ExploreAsheville.com for the latest fall color report.